The Impact Fellowships Summit is a forum for leaders and managers of fellowship programs. The summit facilitates learning, sharing, and networking to support leaders and drive positive change in communities. 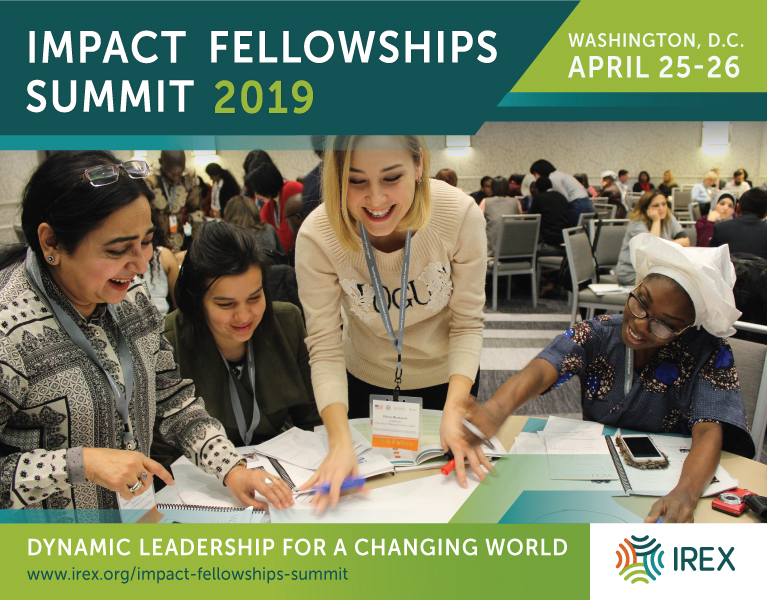 The 2019 Impact Fellowships Summit will be held on April 25 and 26 in Washington, DC. The theme will be Dynamic Leadership for a Changing World. Participants and facilitators will learn from each other, share tools and ideas, and build a community of fellowship program innovators. Employees from more than 80 organizations are attending the summit. They represent a range of organizations, including small and large nonprofits, international NGOs, corporations, universities, and foundations, from 34 cities and 4 countries. View the list of organizations. The Impact Fellowships Summit was founded in 2016 by Atlas Corps, ProInspire, and Public Allies. Building on the founding organizations’ great work, IREX took on the convening role for the IFS in 2018. We are grateful to the IFS Steering Committee for their invaluable guidance and support. IREX has managed fellowship programs with participants from more than 100 countries and promoted leadership development for nearly 50 years. We look forward to leveraging this experience while maintaining the summit’s spirit of collaboration, flexibility, and learning. Inclusivity: We will promote diversity and inclusivity through summit outreach, session design and selection, and accessible spaces and content for all attendees, including persons with disabilities. Community-driven: We will ensure that the structure and design of the summit reflect the priorities of attendees, that the majority of individual sessions are proposed and led by attendees, and that we collect feedback from attendees throughout the summit to ensure we are on the right track and can iterate as needed. Creativity: We will support proposal ideas that encourage creative thinking and innovation. We will foster an interactive and collaborative space at the summit that challenges all of us to think outside the box, challenge assumptions, and take risks. Outcome-focused: We will create opportunities for attendees to identify tangible solutions, try out relevant methodologies and tools, and connect with potential collaborators.